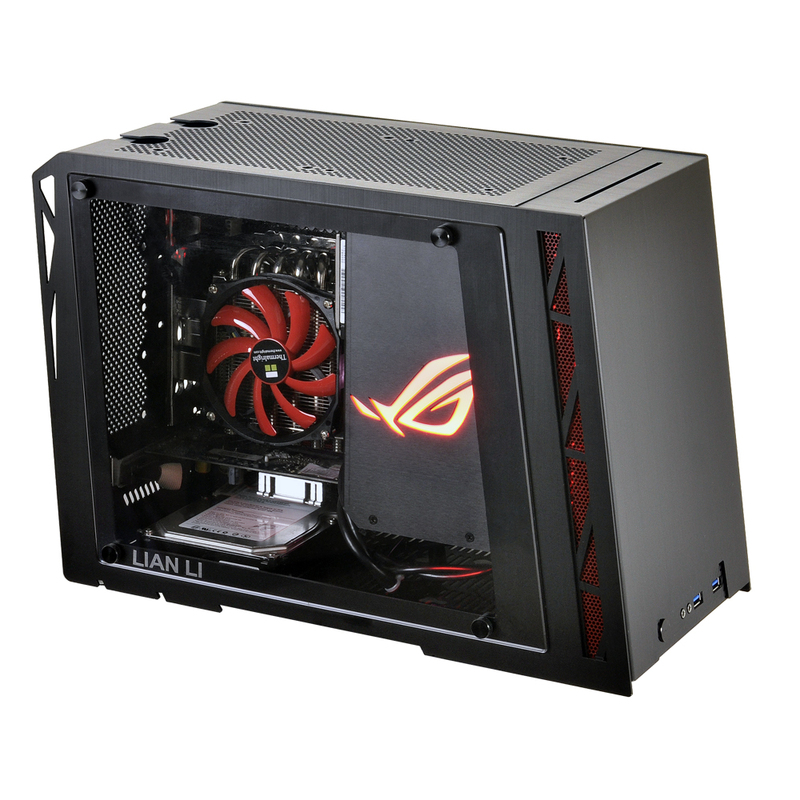 The C7Z170-OCE is aimed squarely at the three-GPU user on Skylake. The PLX8747 chip splits the PCIe lanes into x16/0/x16 or x16/x8/x8, leaving the chipset enough space to add in an M.2 slot for up to PCIe 3.0 x4 bandwidth and plenty of space on the bottom to make sure all the headers can still be used when dual slot cards are in play. We have tested the PLX8747 before, and found that the chip does not noticeably (sub-1%) reduce performance when in use. As SuperMicro is still feeling its way around the consumer motherboard space, we are seeing features that enthusiasts are used to being promoted as positive points. 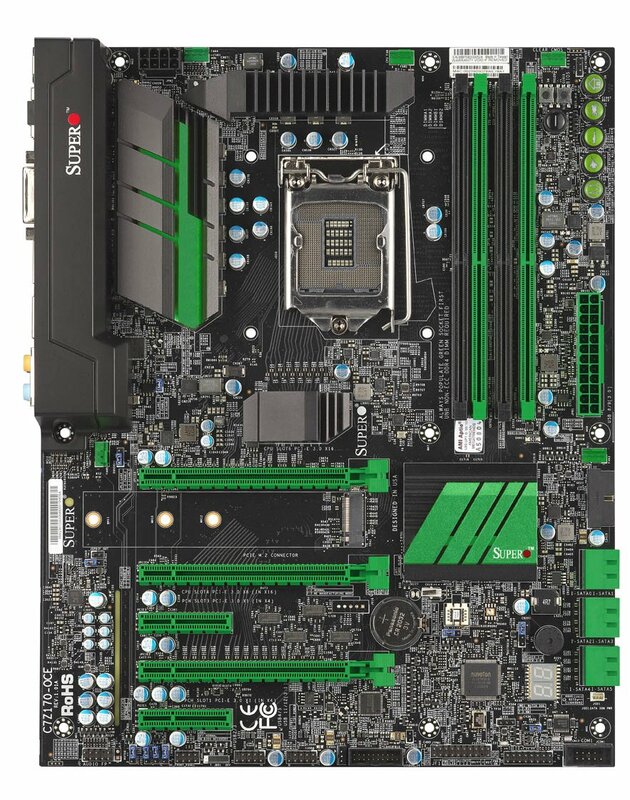 So for example this board also gets some buttons for pre-overclock modes in the top right, and promotes features such as ‘SuperFlash’ which other motherboards have had for almost half a decade. Details are a little sketchy at the moment; more on this as we find out additional information. Featuring the latest in gaming hardware from BIOSTAR, the all-new RACING Series is built with powerful hardware design based around the Intel 100-series chipset. Super Durable Ferrite chokes for high-quality power delivery to vital components, Super Durable Solid Caps for longer-lasting performance, low-latency Intel LAN. Storage via super-fast SATA Express and PCI-e M.2 slot allow rapid access to the latest generation of storage devices. 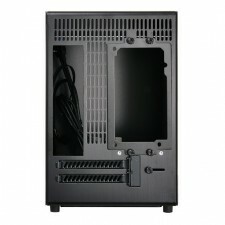 DUAL BIOS guarantees resilient motherboard operation whenever BIOS fails. 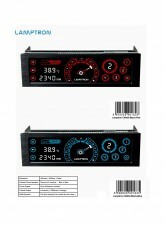 All this new features are reflected in the Racing series which are intended to give the best experience for all users. 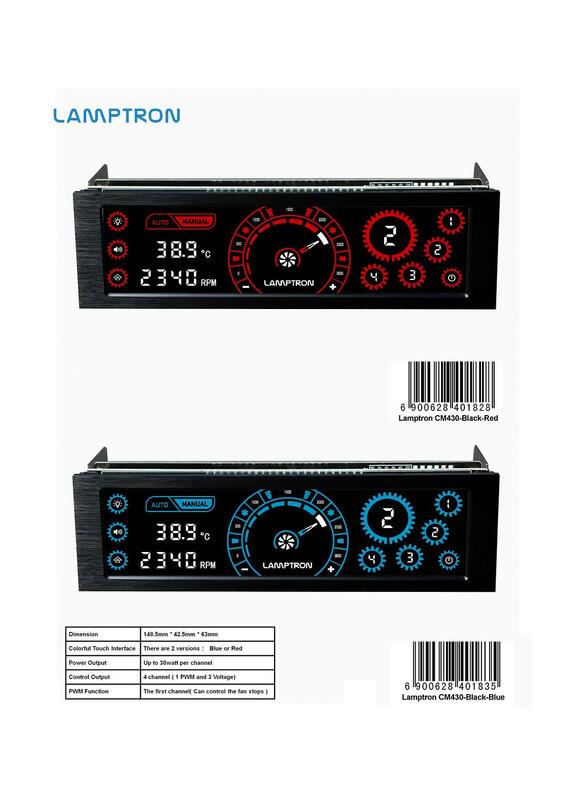 GT Touch features one-touch mode selection: Sports mode for a performance boost and Eco mode for optimized energy consumption.Designate onboard LED configuration for each profile individually VIVID LED DJ software. Speed+, Audio+, Video+, Durable+, Protection+ and DIY+. 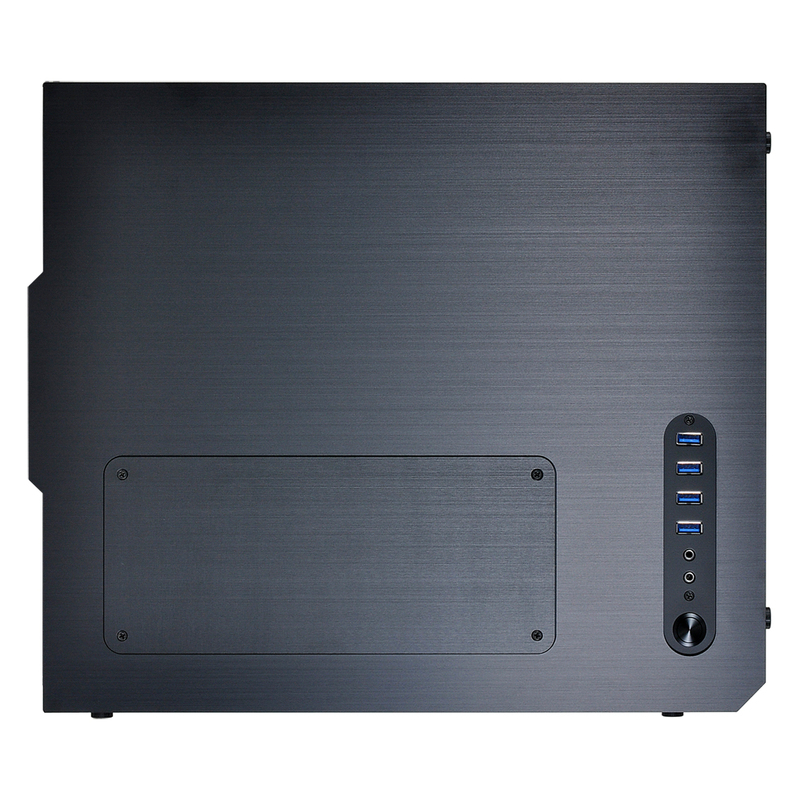 With the aim of designing high-end products for Lifestyle , Computer and Day-to-Day usage, RAIJINTEK was established in 2013 to accomplish the future of IT and Lifestyle products. 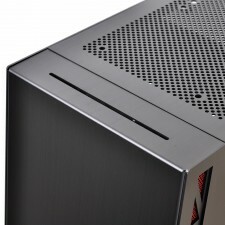 One of the biggest features of the PC-Q04 is its vents – they are the only things that could be described as “big” on this case. 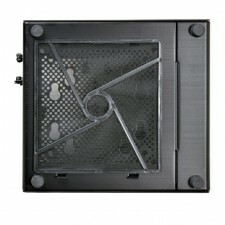 The large side vent lets the PSU draw and vent out its own air to work as efficiently as possible. 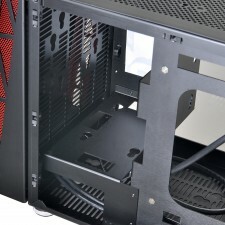 Meanwhile, the bottom left and right vents as well as the entire floor panel allow the GPU to take in air as needed while giving the CPU enough room to breath. 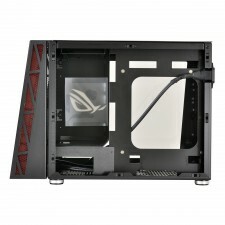 The rear panel is another large vent to let warm air escape. 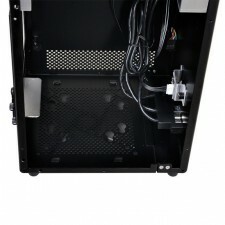 Tall rubber feet prevent vibrations and suspend the case to let air flow readily through the bottom vent. 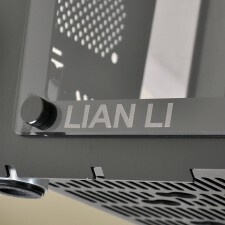 The PC-Q04 uses a familiar Lian Li vertical-mounted Mini ITX system layout. 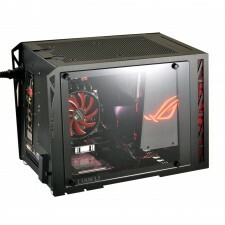 A full ATX size PSU of up to 160mm is mounted opposite the CPU, giving a full 70mm clearance for coolers. Video cards can be up to 190mm long; the case has two expansion slots with an extra margin for especially thick cards. There are two locations to mount hard drives: one 3.5” or 2.5” drive on the floor panel and two more drives, one 2.5” and one 2.5 or 3.5”, on a removable tray at the top. 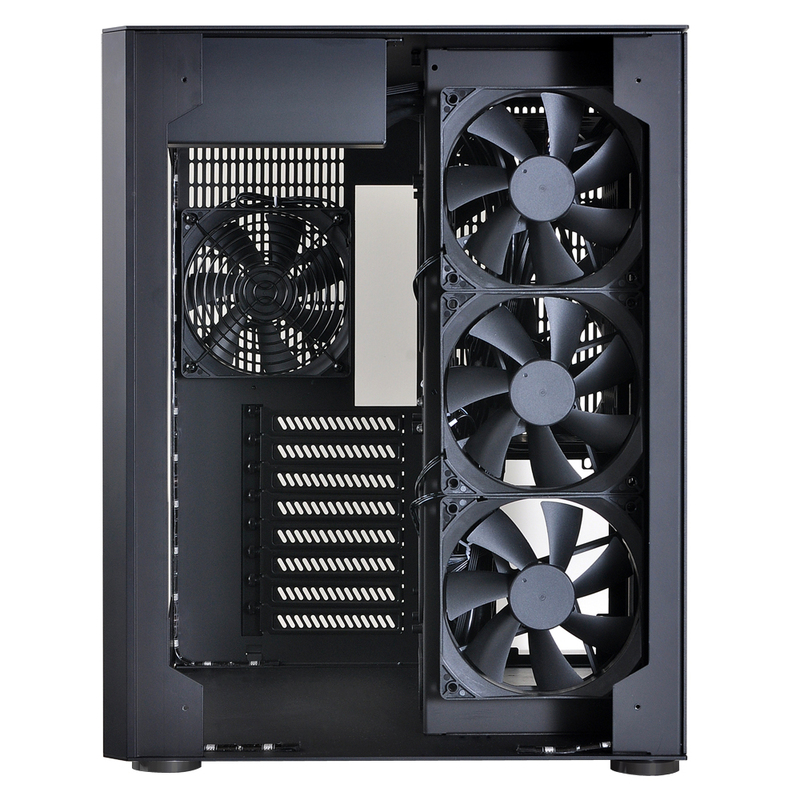 The floor can instead be used for a 120/140mm fan if necessary. 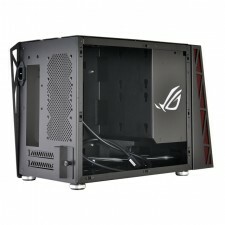 There is only the power button, two USB 3.0 ports, and HD audio ports on the front panel. 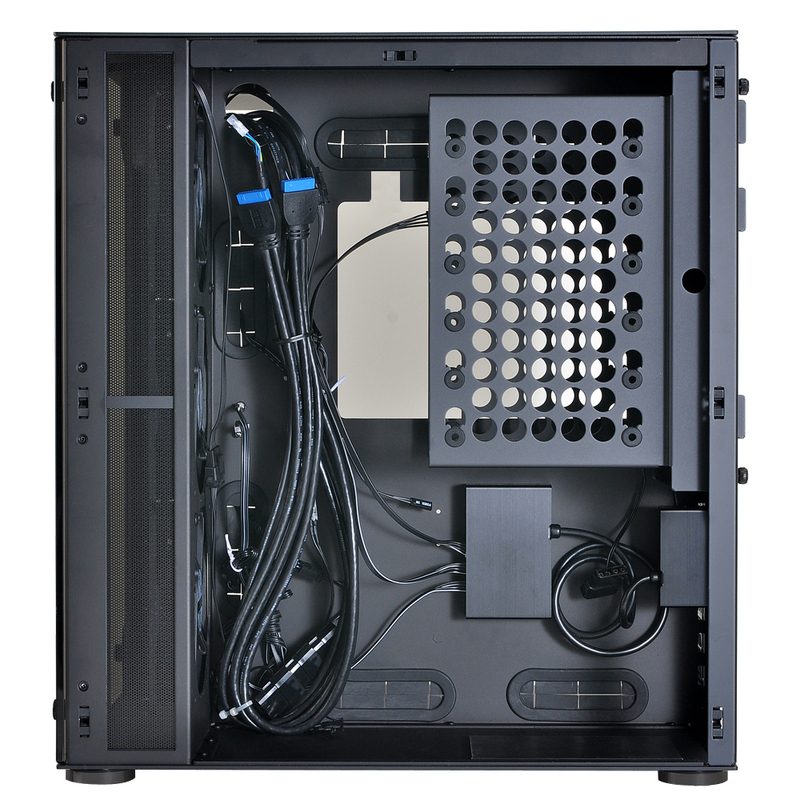 On the back panel are the usual two expansion slots, PSU and motherboard cut outs, and the large vent. No fans at all. Compared with other Q series cases, the PC-Q04 adds extra volume near the top and bottom panels, instead employing spacious vents to preclude the need for cooling fans. 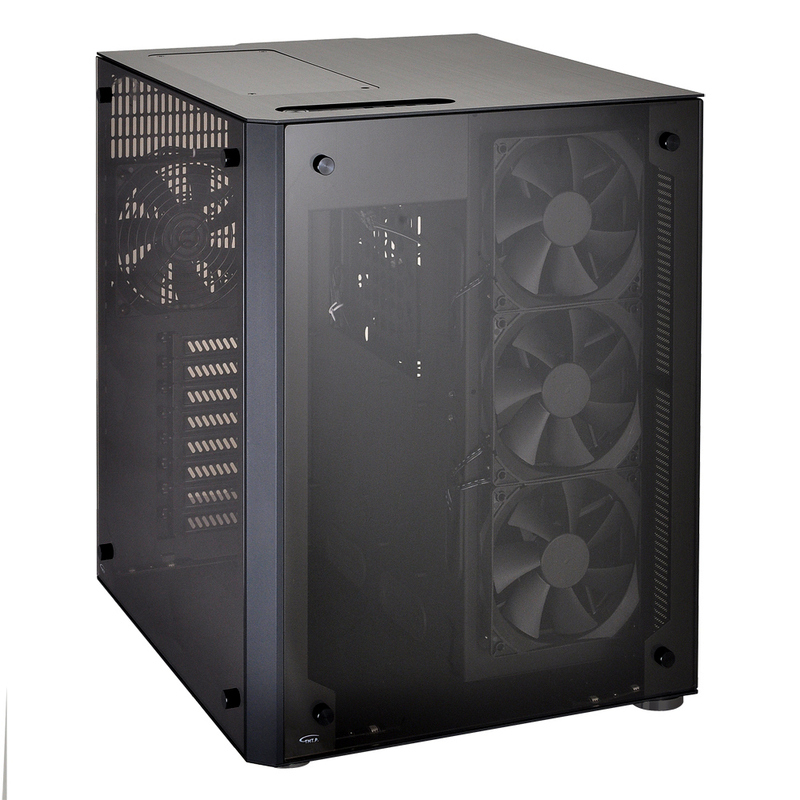 The PSU cycles its own airflow without affecting other components. 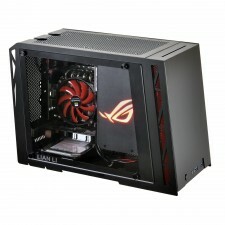 The GPU similarly can pull air directly from the bottom and side intakes and vent directly from its fan. 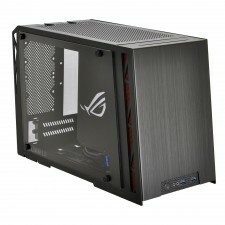 The CPU is more sheltered and requires a smaller cooler. It vents through the oversized back panel as air will naturally flow that way. 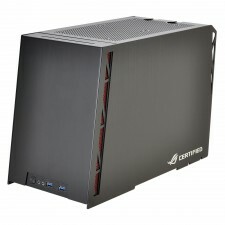 The PC-Q04 will be available in early December at Overclockers UK for £44.90. 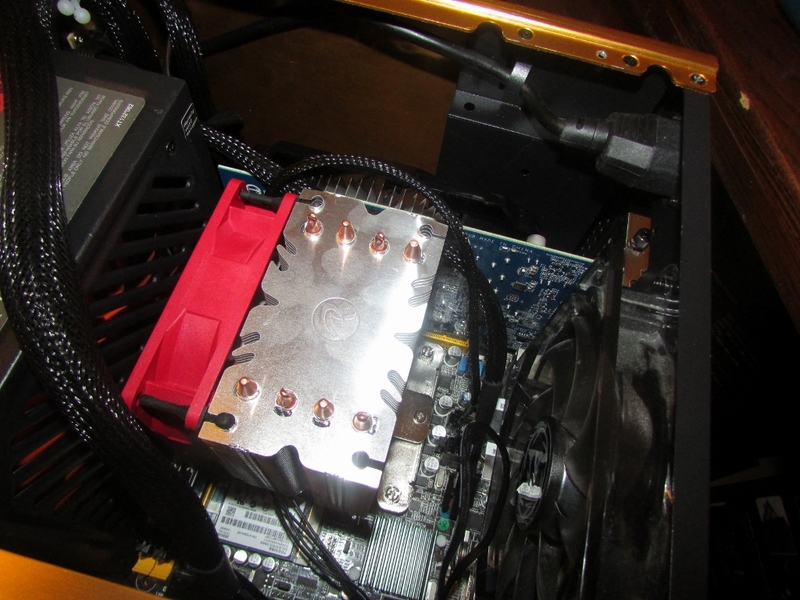 At least it will be fanless until the modders get their hands on it. 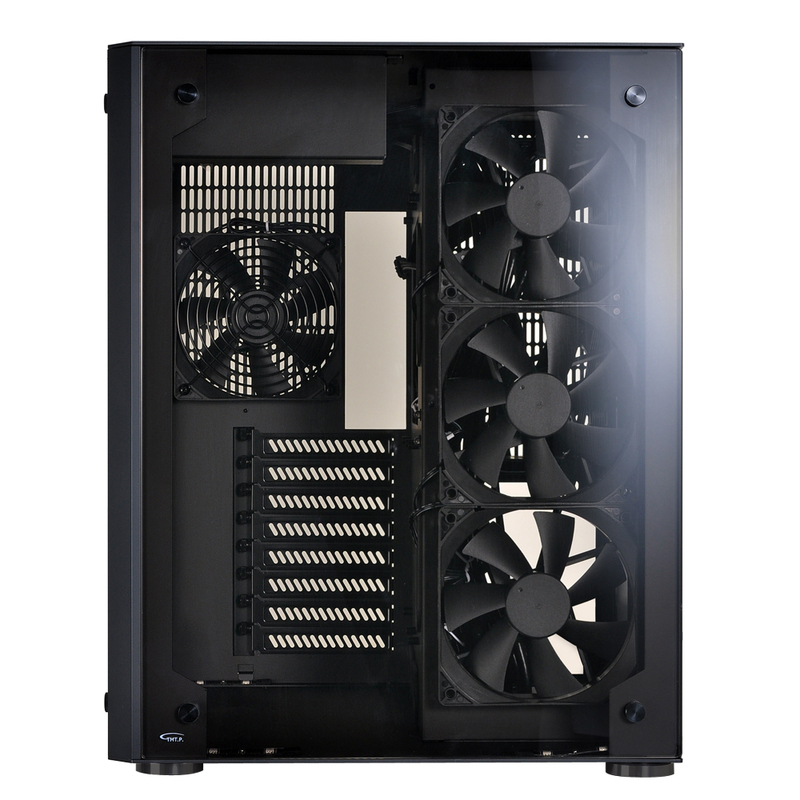 With space for a 240mm radiator on the top panel, 120mm on the back panel, and up to a 140mm CPU cooler – this little case gives builders enough flexibility to install almost any kind of water or air cooling setup. Hmmm this products is certainly very distinctive if anything and will be sure to attract attention. A smart monitor equipped with a microphone, piercing siren, and battery backup for your peace of mind and constant protection. 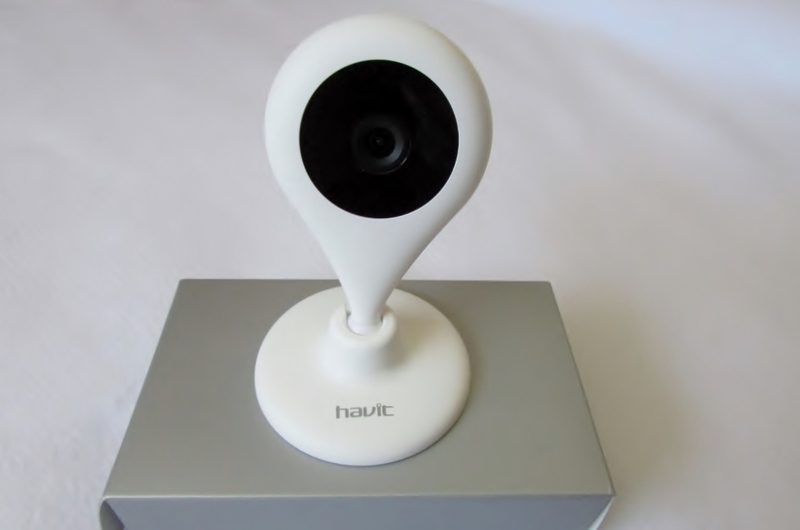 It can serve as a baby monitor, pet monitor, nanny cam, home security system, small business security system and more. Full 720p camera provides a clear HD video. Wide 120 degree viewing angle ensures you can see the entire room. Fully automatic infrared night vision maintains clear videos in low light settings. Easily connects to your smartphone, can enjoy peace of mind when you’re out. The built in microphone allows for complete live face to face video conferencing with both video and audio. Set up instant alert notifications to be sent directly to your mobile phone. Find out instantly when something is happening and if you need to alert the proper authorities. “After being liberated from the shackles of machines by advancing technology, weary people finally get time to pursue their ideal life – this is what Thoreau said in his masterpiece Walden. Now the enterprise has numerous loyal users in more than 160 countries. Having its trademark registered in over 60 nations, HAVIT has become a world-known brand in fashion and techniques. With various platforms such as China Import and Export Fair, GITEX Dubai, CeBIT Germany, CES/ASD America and UK’s NEC Display,the company has been making achievements in its global business and received good reputation among customers. It is attempting to fulfil each client’s ideal of perfection with unremitting effort. Welcome to the future of electronics- a future not being made in a factory, but within the ambitions of people just like you, for you. Mice are almost ‘ten a penny’ these days and competition is fierce and demanding, which in turn forces other companies to innovate. 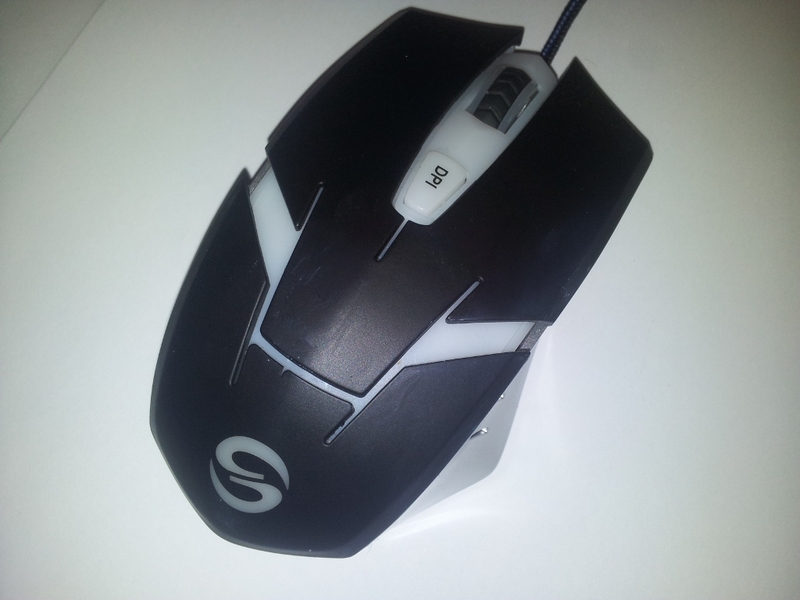 A single mouse can range from a cost effective solution that just about does the job for a ‘point and click’ use to those that are highly engineered and attractive products indeed. The former can start as little as around £4.00 pounds sterling to that of gaming mice where £50-£70 is the norm and even £100 for a mouse is not unheard of. But this leaves the ground open between the two extremes and the battles on this ‘no-mans land’ are cut throat and deadly. Enter the UtechSmart with their low-cost gaming Mouse, The Mars edition. At UtechSmart, we make people-inspired products and solutions. For all these years it has been our passion and mission to keep challenging ourselves create products that make people’s lives better, easier and more fulfilling by day to day. UtechSmart products enhance the technology that connects us to the people, activities and experiences we love…. June 11, 2015, Keelung, Taiwan – Lian-Li Industrial Co. Ltd today launches the PC-O8 dual-compartment chassis. 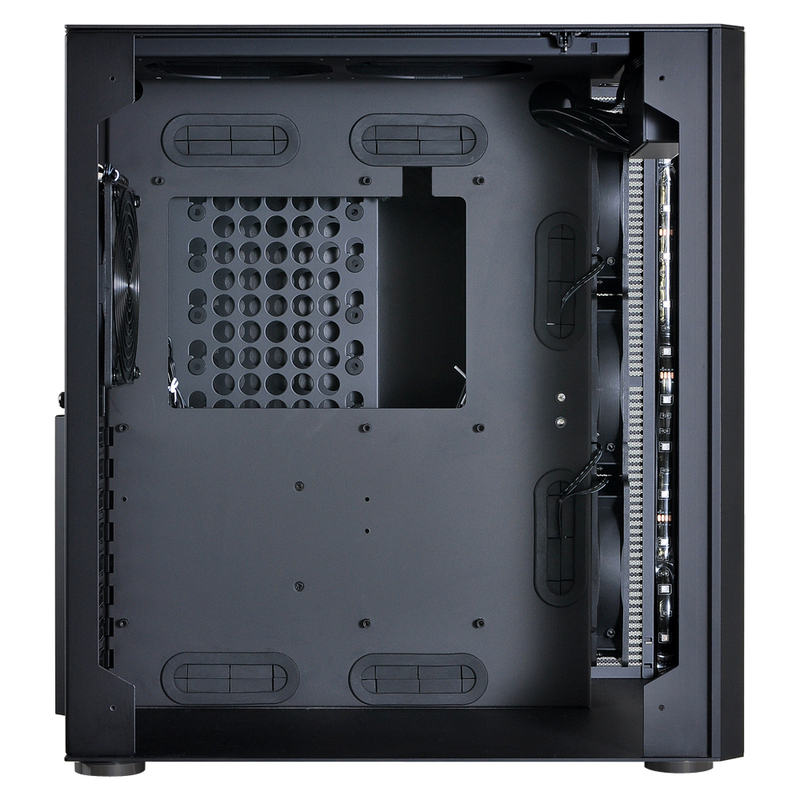 Comprised of aluminium and tempered glass, the PC-O8 allows DIY builders to show off their high-end, intricate setups, while hiding cables and less eye catching components in the large compartment behind the motherboard tray. DIY enthusiasts can adjust the interior lighting through the included RGB lighting kit complete with LED strips, cord clip, dimmer and controller. The back mounted controller allows instant analogue colour selection. 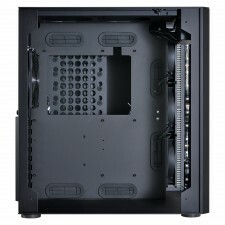 The PC-O8 has many tool-less features allowing for simple setups and installations. This aluminium and tempered glass chassis features easily-removable panels, tool-less mounting for hard drives as well as slide-in dust filters. 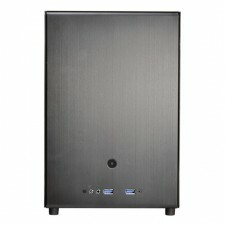 The PC-O8 will be available in early August at Overclockers.uk for the suggested retail price of GBP 339.90. Computer water cooling has been all the range in the last decade and more so within the last three years. Cashing in on this industry are a myriad of differing manufacturers, providing a whole plethora of solutions that is catered for the end-user. One of these are closed-loop liquid cooling systems-offering great ‘bang-for-buck’ prices, however in reality these early solutions performed only on a par with high end air cooling solutions and were a disappointment in general. 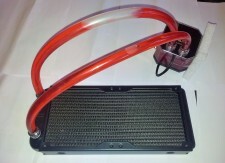 In recent years that has changed a great deal, with many products easily overpowering that of a large heatsink/fan and whilst not approaching the power and performance of a custom water cooling solution, they ‘All In Ones’ do have sit between both extremes and as such they have their own place on the market today. 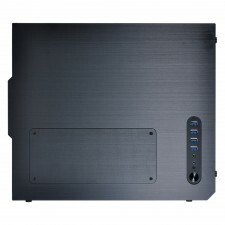 One such company that wishes to provide a solution for this segment of the market is the Raijintek Triton. Fully dedicated to develop best Products for global users, RAIJINTEK’s R&D team never forget the aim to provide a friendly and performing product . 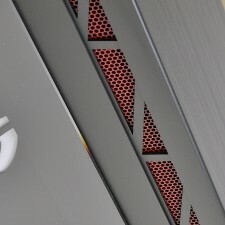 Decades experience in industry, RAIJINTEK management would never give up service and product quality to value customers.